Everyone gets a design they love because every design can be changed on the spot! Guests can customize with their favorite colors add a splash of flair by adding hearts, flowers or stars to any design on my "menu". A custom party is completely up to you! -You may hand-pick designs you want me to offer by choosing from my website & facebook page, or if you prefer, you can have me bring designs of my own choice. -If given advance notice, I can create brand new custom designs for your party based on your ideas, theme or pics you share with me. The cost for a custom party is $75 for up to 10 people painted. 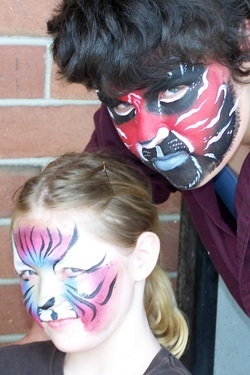 If your party is larger, the rate is $5 per additional face painted. This works out to be $85 for up to 12 people painted, $125 for up to 20 people painted. As with all parties & events, you must pay $25 up front in order to book your party. However, you may choose to pay more or all of your balance in advance if that makes it easier for you on party day. Any remaining balance of your cost/fees is due upon my arrival at your event. BLING Parties are also available! This is for a glitter tattoo ONLY party. This provides your guests with a fun, WATER-PROOF, long lasting reminder of all the fun they had on your special day! I have over 40 designs to offer your guests. The tattoos generally last 10 days or more & I do provide instructions for removal should your friends want to take them off for any reason. As with a custom party, I am happy to bring designs that coordinate with your party theme! I just need a minimum of 3 weeks advance notice so that I can order a supply of those styles to make sure there is enough for everyone. Add ons are available to give your party a little something extra. Check them out here.